there is only a little smell left. May 17, 2013 Woody on left and Maudine on the right. Maudine grew almost 5" since yesterday! Woody opened on May 14, 2013 starting around 1PM. May 14, 2013 Height 72.5"
Won't be long now. Visiting hours for today are 12PM - 4:30PM. 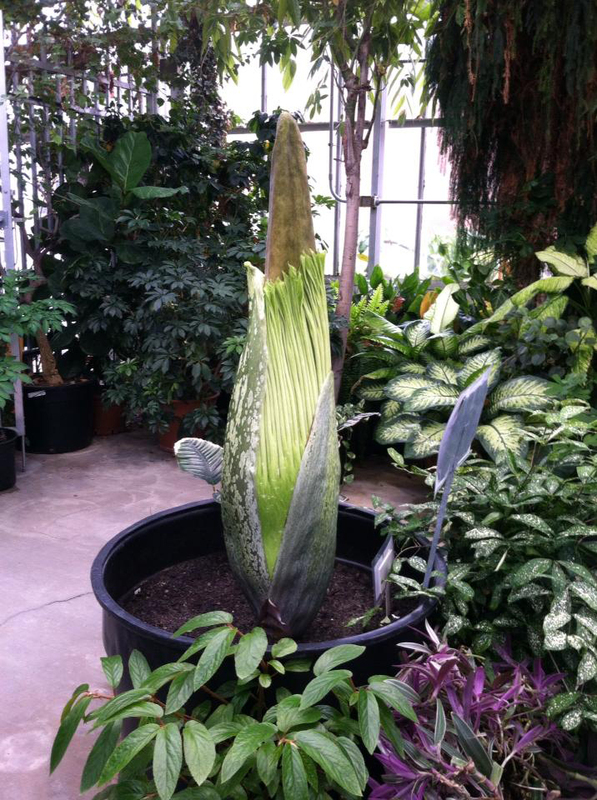 We will announce special visiting hours when the bloom begins to open. May 13, 2013 Height 71"
Keeping a close eye on Woody today. Blooms usually open in late afternoon. May 12, 2013 Height 69.75"
We see a trace of sap coming down the flower stem which means the opening of Woody's flower will be very soon! May 11, 2013 Height 68"
Woody is now taller than either of our previous blooms! The protective sheathes that cover the emerging bud are falling away. May 10, 2013 Height 65.25"
May 9, 2013 Height 61.5"
May 8, 2013 Height 56.25"
May 7, 2013 Height 51"
May 6, 2013 Height 46"